Jacqui Martinez is an artist in the truest form. She is a painter, visual artist, set designer and educator currently attending NYU Steinhardt’s Master’s program for Art Education. Her uncut artistic style manages to give you a feel of the new with the flavor of the old school. Her angst and love is fluent throughout her work. 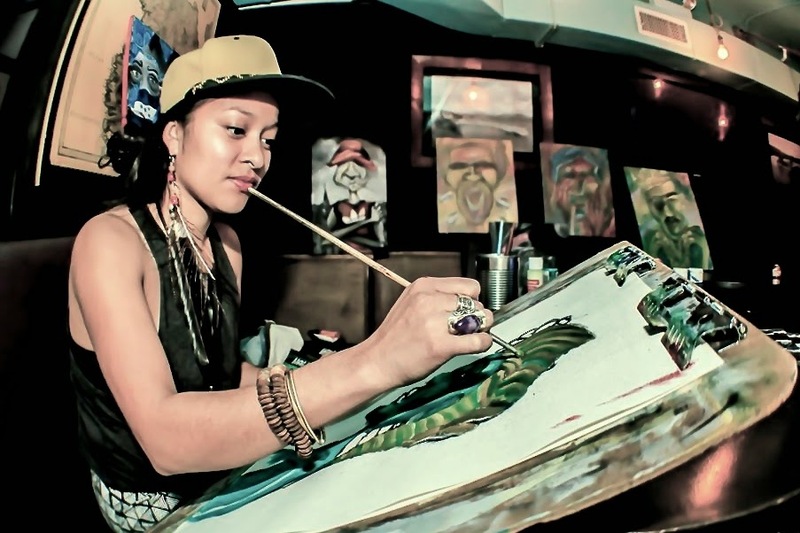 Jacqui’s paintings range from old world to contemporary with an influence of her Honduran heritage and her love of the Hip Hop culture. She always seems to be on the go; whether it’s teaching art/theater workshops in Arusha Tanzania, being an art educator in her community or taking adventures around the world that inspire her artwork. Where will Jacqui take flight next? I don’t know and you probably won’t know either, but the strength and the passion in her artistry will remain intact. Which artists inspired you to become an artist? A person that inspired me as an artist is Frida Kahlo. I did research on her in high school and I was really drawn to her work. As I looked further into it, I was inspired by what she represented: An artist who truly and literally healed through art. Her work is unapologetic, raw, and amazing. Also it takes serious courage to paint a self-portrait, something I still haven’t done. Frida practiced that all the time. Justin Bua is one of my favorite technical painters. I like the exaggerations of his art and the content of his work. I have a love hate relationship with Picasso, but admire the path he’s paved They all have taught me staying true to yourself is the only real way not to compromise your soul. When do you feel like you came into your own as an artist and how did you develop your artistic style? I would say experimentation and allowing myself to be influenced by everything around me. I love to surround myself by creative atmospheres, whether its theater or a concert, a museum or even coloring with children. My work is influenced by graffiti too. Graffiti is the epitome of exaggeration and bold art. Coming from a movement that has created a culture of incredible thinkers and artists: Hip Hop. I’m a fan. You develop your style by committing to your work. I would find myself in a zone painting for ten hours straight and not noticing until my back would give out and my vision was blurred. You do find yourself as an artist getting stuck in your style and that is problematic at times. At that point you’re not evolving because you’re too attached and not objective about your art. Sometimes you need to start all over on a piece of work. Sometimes you’ll have to take risks. I love painting faces and twisting the most beautiful features. I paint subjects that also address the current states of our communities in a political, cultural, and spiritual platform. How does your experience as an educator influence your artwork? The reason why I love working with the youth is because I feel they are closer to the truth and are more open. It’s such a give-give relationship. They would create artwork and I would show them mine, and to feed off of energy that has honest reciprocation is golden. The current day art curriculums are very basic, especially in low income areas. I would see art programs get shut down across the country while prisons were getting built. They’re firing art teachers because the lack of investment. What I do as an art educator is critically dive into topics and encourage creative solutions. My curriculum incorporates her/history, ancestry, Hip Hop, poetry, theater, amongst other creative mediums. I have gotten my curriculum shut down before and push back from administrations, but I always fight for the side of the student. Anything that benefits them, I’ll always fight for. I also feel there are not enough practicing artists teaching art. If you’re an artist you have to practice your craft every day in order to teach it with mastery or you’re cheating the student. So now I attend NYU Steinhardt’s Master program for Art Education and Community Practice. Most of the program is based on the strategies to improve social justice inside and outside the institutional framework. Your hard work as a set designer came full circle when you along with the ensemble to Evren Odcikin’s play The Oldest Profession got nominated by Bay Area Theatre Critics for Best Ensemble and Best Specialty. Visually how did come up with the set design? It is a collaborative process and working with Evren was great because he articulates his vision so well! I learned a lot in working with a great team. We first read the play, then share thoughts, read again, share more, execute and make things happen. Through the process, I would share my ideas on the set design and then implement them. You don’t only have to think creatively, but be creative in how you communicate with the director. The designer’s responsibility is to take the vision of the director and creatively find the execution by also including your input. Evren wanted a set that was seamless and with the right mood. Veaudville New York. I was able to design and build the set. One of my favorite plays I’ve worked on. You seem to be a global citizen of the world. Anywhere you go, whether it is doing art/theater workshops in Arusha Tanzania or Mexico you fit right into the culture. Why do you think that’s the case? I wouldn’t say I necessarily fit in but I understand my privilege. I have to be humble as I can be when I visit new places. I have to attribute my humbleness to how my parents raised me. You have to be respectful of cultures when you travel and also be engaging with the people. I have a real love for the work and maybe people pick up on it and maybe they don’t but my responsibility is to share, show love and respect everything. When you travel you have to also be open for things to change. Changing is a must when you’re elevated. What are some places around the world that has had the biggest impact on you not only as an artist but a person? Mexico had the most impact on me out of all the places I’ve travelled. I had driven through Mexico and it would take me two weeks to get to Honduras, home. So I never have really known Mexico. There was a Moonaguas collective, an organized trip I was a part of, and we stopped at a shelter for immigrants who were traveling north, most of them from Honduras. Some of these people in the shelter had traveled for miles on end from their home to come to the United States for a better life. I met a young man, who had traveled by foot. His feet were beaten up and bloodied. He couldn’t walk. He told me though, if that train, the beast, comes he has to run to get on it. He was desperate and passionate. That experience hit home for me and made me realize that this border was created to kill and divide people. Keep different people out. Keep the people with less opportunities out. My parents made that journey so I can be here, be an artist. That trip changed my art, my approach to teaching and me. Arusha, Tanzania also changed the kind of womyn I am becoming. I was humbled and spiritually transformed. I was hosted by the United African Alliance Community Center where I was able to teach art, theater and some Spanish. The founders are Pete O’Neal and Charlotte O’Neal who are incredible people that have created an amazing community in Arusha. I want to continue to travel and understand the culture of travel to enhance perspective. I also want to open an art school one day. It would provide tools of consciousness. I want to include professionals, artists and educators to teach themes and subjects that highlight the strengths of the arts. My goals are always evolving. Where can people reach you and see your artwork? People can reach me and take a look at my work on my website. You can also keep up to date with all my adventures through Instagram.